I sense your ancient sorrow, Belovezhskaya Pushcha, Belovezhskaya Pushcha. During the Soviet era, the Belarusian rock group, Pesnyari (The Crooners), vocalized these words in one of the most famous songs of the 1970s. This song, in particular, introduced Belovezhskaya Forest to the world. 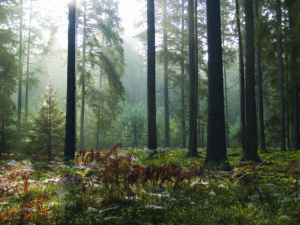 The Belovezhskaya Forest is a symbol of Belarus and her people, and it’s also a reminder to Belarusians at home and abroad that there is a small, wonderful country in Europe with thick, lush forests and clear lakes and streams. It is a country with a difficult historical path, yet it is also home to a happy, worldly people. Belovezhskaya Forest, like a church bell, brings her people together to share in her nation’s future. The previous words are not an exaggeration. Belovezhskaya Forest is not only a unique woodland inhabited by native animals, it’s also a spiritual terrain. The pagan ancestors of the members of Pesnyari prayed to their gods there. The word pushcha, while translating to forest in English, has a deeper connotation within its native language. Specifically, “pushcha” describes deep, dense, impenetrable woods. Belarusian fairy tales, folklore, songs, and literary works often center on Belovezhskaya Forest. Inside the forest, in the thickest of woods – where one could easily become lost – signs warn: Do Not Enter. But we are going to break the rule and look into this forbidden land. Fascinatingly, Belovezhskaya Forest and America’s Yellowstone National Park resemble each other in an almost familial fashion. Even the animals, like the Belarusian bison and the American buffalo, seem to parallel one another. While perhaps not entirely like siblings, the animals are alike enough to be cousins. Unfortunately, human intervention has been required in order to ensure their continued survival in both parks because of relentless hunting. 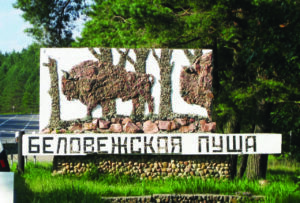 Nowadays, the Belarusian bison experiences safety and peace in the 600-year-old virgin forestland of the Belovezhskaya Forest. The Belarusian bison symbolizes Belarus much in the same way that the American buffalo captures romantic ideals of freedom in the open western land of the United States. Legends and magical stories are attributed to the Belarusian bison. For example, one narrative believed by many says that the strongest poison, when poured on the horn of the bison, is rendered useless and impotent. Other enchanting stories tell of the healing powers of a giant 600-year-old oak residing in the woodland. Folklore indicates that to receive this healing power, you must embrace this oak and project “pure” thoughts. Oak groves remain preserved in the forest and are amongst the most gigantic and unique endemic plants in the world. Similarly to J.R.R. Tolkien’s, The Hobbit, Belarusian ‘hobbits’ performed healing rituals. Pagans worshipped and carried out ceremonies amongst rocks and boulders – one of these boulders, a slab with cracks and dents believed to resemble footprints of a Neanderthal man, measures over five feet. Even today, people follow the tradition of collecting rainwater from the dents in order to wash out their eyes and to cleanse the sick. In addition to encompassing legends and spiritual chronicles, Belovezhskaya Forest also has extensive annals, and history often acts like the shuffling of a deck of cards. Belovezhskaya Forest, started in 1409, changed ownership from Lithuanian princes to Polish kings to Russian tsars. The forest offered royal hunts, a favorite pas-time, and fodder for novels and films of adventure and intrigue. Nobility chased prey within the forest; finely-dressed equestrians and their beautiful dogs and horses presented an unforgettable pageant. Even today, hunters can enjoy pursuing game in the forest and take home trophies. In the past, overhunting brought many of the forest’s wild animals close to extinction. The last free-roaming Belarusian bison perished in 1919, at which point Belarus created a preserve in order to rebuild the population. Now, the bison number is greater than 300, and alongside live plenty of wild boar, roe deer, moose, foxes, wolves, lynxes, martens, badgers, otters, grouse, eagles, and woodpeckers. These native species thrive in the clean, purifying air of the Belovezhskaya Forest. In modern history, the forest has hosted the leaders of Russia, Ukraine and Belarus, who signed the historical documents out- lining the dissolution of the Soviet Union in 1991. The “Evil Empire,” as President Ronald Reagan called the U.S.S.R., ceased to exist. The local alcohol – named zubrovka, after the great bison – is made of the same grass and roots that the powerful bison eats. Some historians joke that the zubrovka may have impacted the world leaders as they signed the dissolution agreements. Even so, zubrovka is created from the purest waters found deep in the woods and is considered to be a very rejuvenating drink. Belarusians fully believe that those who try the spirit will fall in love with both Belarus and the Belovezhskaya Forest. Tourists in the forest often note how hospitable and kindhearted they find the Belarusian people. Accommodations can be found in hand-built wooden houses where you can appreciate the pristine environment. Tourists can enjoy natural Belarusian foods and the cleanest water while relaxing in one of the forest’s green restaurants. However, don’t plan on dieting while in Belarus. Gourmet foods include 40 varieties of potato pancakes (draniki), offered with sour cream, bacon, wild berries and mushrooms or cheese. Rumor has it that the national hockey team of Belarus eats draniki before games in order to power the puck; furthermore, Belarusian President Alexander Lukashenko, who loves to play hockey, feasts on draniki before getting on the ice. For tourists, prices in Belarus remain modest compared to other European nations. 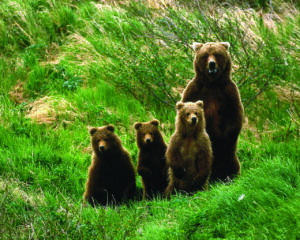 Belovezhskaya Forest Preserve proudly boasts its designation as a World Heritage Site, in 1992, by The United Nations Educational, Scientific and Cultural Organization (UNESCO). And, with charming smiles, some of the most beautiful European women, flaxen-haired and kindhearted, welcome you to their native land. the President of Belarus for Sports and Tourism.